Today, the falls are defined by the locks and dams of the Upper Saint Anthony Falls, just downstream of the 3rd Avenue Bridge, and the Lower Saint Anthony Falls, just upstream of the I-35W Saint Anthony Falls Bridge. These locks were built as part of the Upper Mississippi River 9-Foot Navigation Project. The area around the falls is designated the St. Anthony Falls Historic District  and features a 1.8-mile (2.9 km) self-guided walking trail with signs explaining the area's past. In 1680, the falls became known to the Western world when they were observed and published in a journal by Father Louis Hennepin, a Catholic friar of Belgian birth, who also first published about Niagara Falls to the world's attention. Hennepin named them the Chutes de Saint-Antoine or the Falls of Saint Anthony after his patron saint, Anthony of Padua. Later explorers to document the falls include Jonathan Carver and Zebulon Montgomery Pike. Following the establishment of Fort Snelling in 1820, the falls became an attraction for tourists, writers and artists who sought inspiration even if Hennepin's descriptions were not as majestic as hoped for. By the 1860s, however, industrial waste had filled the area and marred the falls' majesty. Further competition over the power of the falls on both banks of the river led to its eventual downfall when it partially collapsed in 1869 and was reinforced and subsequently sealed by a concrete overflow spillway (or "apron"). The area around the river was added to the National Register of Historic Places as the Saint Anthony Falls Historic District in 1971 which includes 8th Avenue Northeast extending downstream to 6th Avenue Southeast and approximately two city blocks on both shoreline. The district's archaeological record is one of the most-endangered historic sites in Minnesota. The National Register of Historic Places is facilitated by the National Park Service. 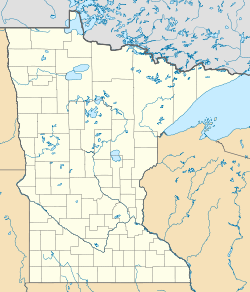 The national significance of the Saint Anthony Falls Historic District is a major reason why the National Park Service's Mississippi National River and Recreation Area was established along the Mississippi River in the Minneapolis – Saint Paul metropolitan area. For untold generations of Indian people the Mississippi River was an important canoe route. To pass around the falls, the Dakota ( Sioux) and Ojibway (Chippewa) used a well-established portage trail. Starting at a landing below the site now occupied by the steam plant, the trail climbed the bluff to this spot. From here it followed the east bank along what is now Main Street to a point well above the falls. Geologists say that the falls first appeared roughly 12,000 years ago about 10 miles (16 km) downstream at the confluence of the glacial River Warren (at present-day Ft. Snelling). Estimates are that the falls were about 180 feet (55 m) high when the River Warren Falls receded past the confluence of the Mississippi River and the glacial River Warren. Over the succeeding 10,000 years, the falls moved upstream to its present location. The water churning at the bottom of the falls ate away at the soft sandstone, eventually breaking off the hard limestone cap in chunks as the falls receded. From its origins near Fort Snelling, St. Anthony Falls relocated upstream at a rate of about 4 feet (1.2 m) per year until it reached its present location in the early 19th century. Tributaries such as Minnehaha Creek begot their own waterfalls as the Mississippi River valley was cut into the landscape. When Father Louis Hennepin documented the falls he estimated the falls' height to be 50 or 60 feet (18 m). Later explorers described it as being in the range of 16 to 20 feet (6.1 m) high. The discrepancy may have been due to scope, as the current total drop in river level over the series of dams is 76 ft (23 m). 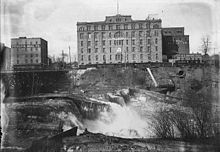 As Minneapolis (and its former neighbor across the river, St. Anthony) developed, the water power at the falls became a source of power for several industries. Water power was used by sawmills, textile mills, and flour mills. Millers on the Minneapolis side formed a consortium to extract power by diverting upper-level water into waterwheel-equipped vertical shafts (driven through the limestone bedrock into the soft, underlying sandstone) and then through horizontal tunnels to the falls' lower level. These shafts and tunnels weakened the limestone and its sandstone foundation, accelerating the falls' upriver erosion to 26 feet (7.9 m) per year between 1857 and 1868. The falls quickly approached the edge of their limestone cap; once the limestone had completely eroded away, the falls would degenerate into sandstone rapids unsuitable for waterpower. The mills on the St. Anthony (east) side of the river were less-well organized harnessing the power, and therefore industry developed at a slower pace on that side. The early dams built to harness the waterpower exposed the limestone to freezing and thawing forces, narrowed the channel, and increased damage from floods. A report in 1868 found that only eleven hundred feet of the limestone remained upstream, and if it were eroded away, the falls would turn into a rapids that would no longer be useful for waterpower. Meanwhile, the St. Anthony Falls Water Power Company approved a plan for the firm of William W. Eastman and John L. Merriam to build a tunnel under Hennepin and Nicollet Islands that would share the waterpower. This plan was met with disaster on October 5, 1869, when the limestone cap was breached.